McCallie Guitar Quartet appeared on Show 282, recorded in January 2014. 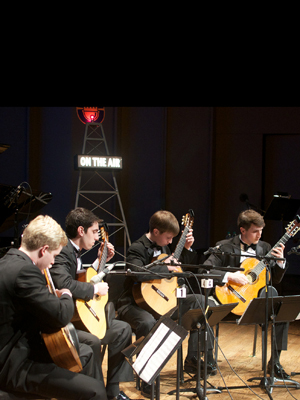 McCallie Guitar Quartet is a guitar ensemble based at the McCallie School in Chattanooga, Tennessee. The members include 17-year-old Ralston Hartness and 16-year-old Griff Jayne, both from Chattanooga, Tennessee; and 17-year-old Matthew Norris and 16-year-old Drew Shikoh, both from Signal Mountain, Tennessee. They are coached by Charles Evans.